gentrification | Park View, D.C. Thanks to Borderstan for the heads up on this, the documentary DogParks & CoffeeShops: Diversity Seeking in Changing Neighborhoods is part of the Reel Independent Film Extravaganza at the Angelika Pop-up Theater at Union Market this coming weekend. The filmmakers will also hold a free screening and discussion of the film at the Northeast Neighborhood Library at 330 7th St. NE at 2:30 p.m. Oct. 10. This film is based on research that explores diversity-seeking, community, and consumption in neighborhoods undergoing urban revitalization. In a study of three neighborhoods in Washington, DC, it finds that differences in resources, cultural norms and cultural preferences lead to tensions among some residents and perceived exclusion from consumption opportunities for others. Borderstan has much more information on this film for those interested in learning more and planning on seeing the film. And from this subset of neighborhoods, identify which of these grew faster (in median property and income values) than the relative income and home values in the city. 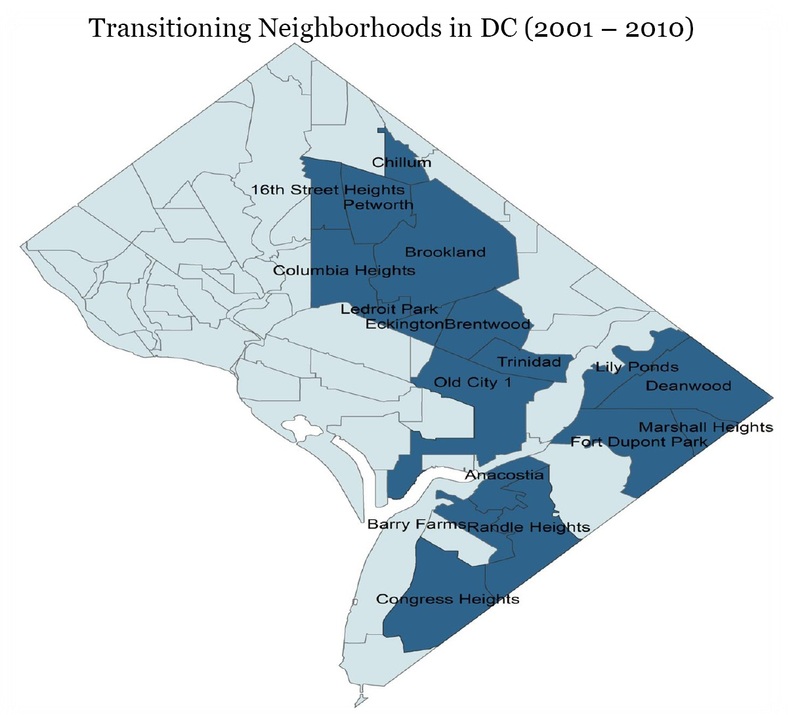 In reviewing the paper’s neighborhood map (click on thumbnail above), it is quickly evident that the report identified neighborhood “areas” rather than true neighborhoods, thus indicating that there are more than 18 Washington neighborhoods in transition. 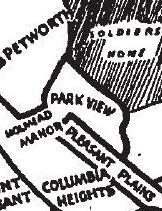 For instance, the Columbia Heights node includes Park View, Pleasant Plains, and Ward 4’s North Columbia Heights area. But regardless of the actual neighborhood boundaries or how many neighborhoods are impacted, the overall map does paint a picture of a significant portion of the city in transition. According to the report, neighborhoods in transition tended to have younger populations, with the people moving into them tending to be more prosperous. Race did not appear to be a major factor in neighborhood gentrification overall, with some neighborhoods, such as Deanwood or Marshall Heights, being over 90% black both in 2000 and today. While walking along Georgia Avenue over the weekend I noticed that Bill’s Seafood Kitchen — commonly referred to as Fish in the ‘Hood, has made a significant change to its tag line. 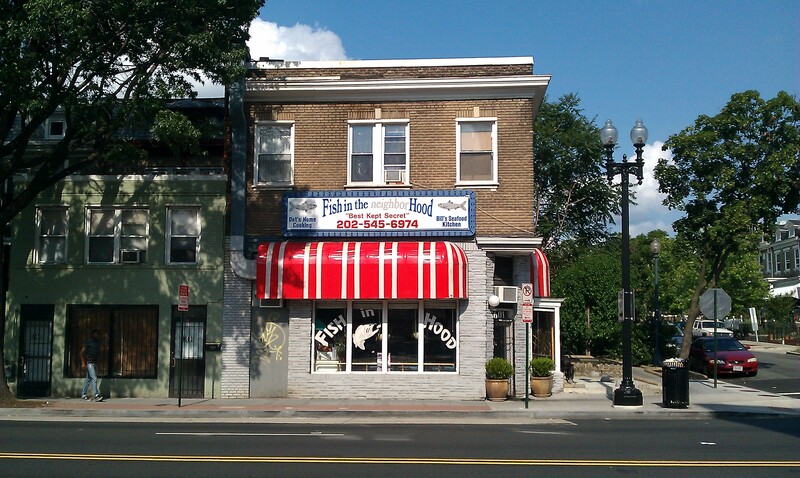 Now, one of Park View’s better kept secrets located at 3601 Georgia boldly continues to sell some of the best fresh seafood offered in D.C. under a new sign that reads: Fish in the neighborHood. The following video at the Washington Post was brought to my attention and I thought it was something that would be of interest to many in the neighborhood. While it focuses on development and gentrification in Petworth, the images of CVS, Looking Glass Lounge, and Blue Banana indicate that the focus is more on the area around the Metro station rather than a particular neighborhood. Has D.C. 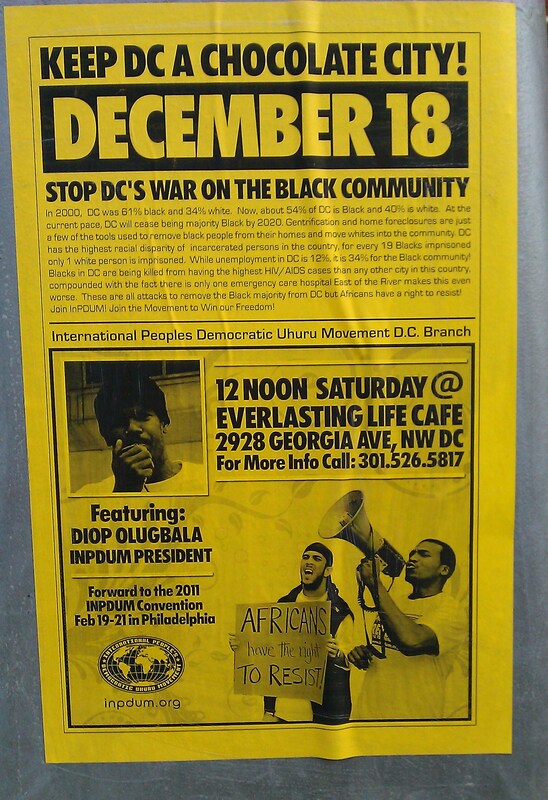 Declared War on the Black Community? Saturday, lower Georgia Avenue south of Park Road was plastered with Keep DC a Chocolate City! posters (example at the right). While it lists many legitimate issues that the City and residents need to address — such as poverty, crime, the impact of development, HIV/AIDS, and displacement — it saddens me that these issues have all been presented as the Black community vs. the White community. Washington is much more complex than that. D.C. has a rich culturally diverse population that continues to diversify. Ward 1 is home to significant Latino communities as well as persons of other ethnic backgrounds. 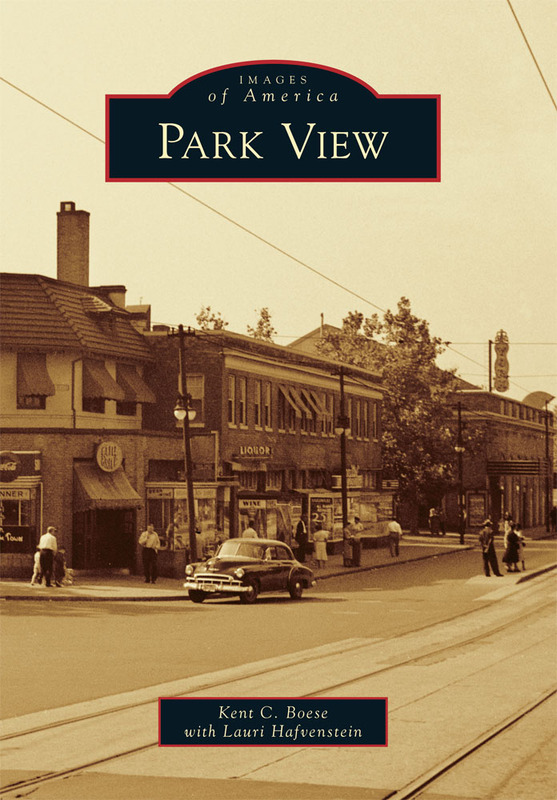 In addition to historically Black neighborhoods changing demographically, there are also parts of the city that many would consider to be historically Black neighborhoods that were originally historically White neighborhoods . As one researches the City’s demography, the only thing that can be said for sure it that populations change over time and are continuing to change. Vince Gray ran on a platform of “One City.” While a noble goal, is it achievable in a climate that is racially charged? Furthermore, can any of the serious issues facing our City be solved when our communities are pitted against each other? The rally is scheduled for December 18th at 2928 Georgia Avenue.